That's great. Precisely the sort of finish I am after. Do you have stock / would you be able to make up the stickers again for my calipers? Perfect, Ian. I'll be in touch. Just had reconditioned 4 pot fronts and single pot rears fitted. OMG! What a difference, its like a different car. Strongly recommend getting this done if you haven't already. Ian - I'll be sending the old ones back in the next few days. Could you give me a price please for a set of recon calipers, disks and your Kevlar pads? Including postage and my old calipers in for exchange? We charge £235 a pair for reconditioned subaru 4 pot calipers on an exchange basis , the calipers are stripped , bead blasted , primed and sprayed any colour you want , we build them up with new stainless steel pistons and new seals and pressure test them. If you want them on an exchange basis we take a deposit of £125 which is refunded once we get your old calipers back , the calipers you send back must have undamaged castings , and no thread damage. If you didn't want to pay the deposit , you can send in your calipers for us to do. We can supply you our grooved discs and comline kevlar pads for £89.99 a set , or our grooved discs with black painted centres and Godspeed kevlar pads for £109.99. Thanks to Ian, I received my new pads and discs last week. Turns out, I need my calipers refurb'd now as they are sticking, and I don't want to warp my new discs. However, my drivers side one looks 10x worse than passengers. It looks like it has sat in sea water for 12 months. I've attempted to attach some pics. Ian, can you let me know if these can be used for the exchange, as I am trying to weigh up the options at the minute. hi Ian how much for strip/paint 2 pot rears in custard yellow (ver 4 sti) with blue stickers the P1 logo if poss and new rear disc's and pads to fit 2 pots as the ones i got when i brought them are standard so want to upgrade. If you just want the calipers stripped , bead blasted , sprayed , polish the pistons and clean the seals and rebuild them , it will cost £120 a pair , if you want them fully reconditioned with new seals and stainless steel pistons then it will be £195 a pair. 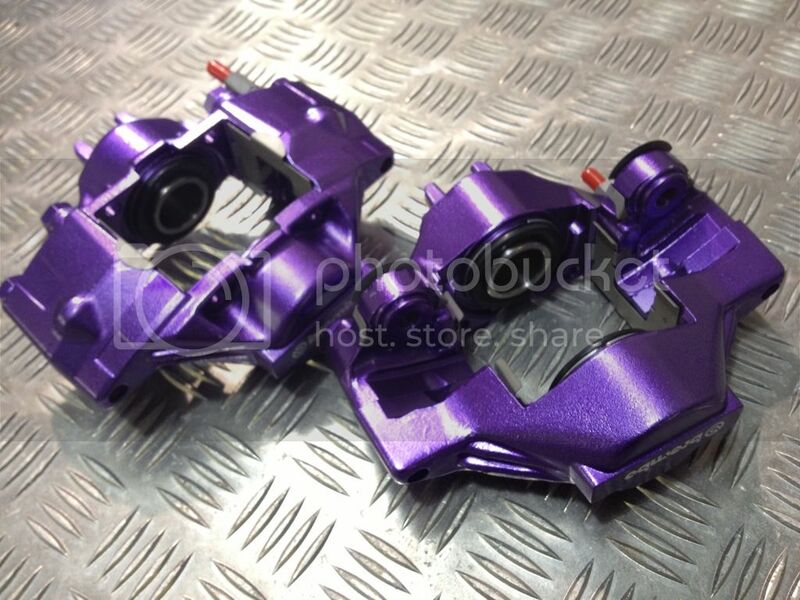 Did some STi Brembo front calipers and WRX rear calipers in Cadbury purple a couple of weeks ago , turned out quite funky ! Hi Ian, I have 2 sets of 4 pots that are both seized but other wise everything else on them is ok, what price for a refurbed set if i send you both down, Bit strapped just now so would send them first before you send refurbed set out lol ..
Only looking for 1 set back would you be willing to take both sets off me for a refurbed set plus your fee ?? hi was wondering what it would cost for a pair of 4 pots ref to the states. California to be exact. Just wondering too! I need front 4 pots done!! I phoned Godspeed yesterday and yes, he's still offering this service. Whats best price you can do on grooved discs front and rear but no pads for my 2007 wrx gb270? Also are these better than the plain brembo discs? I'm guessing it was you we sent them to last week ? Don't think the disc has seen much use could you also skim a bit off this? Thinking either red or the zero sports green I seen a few pages back are you able to apply the brembo stickers also?